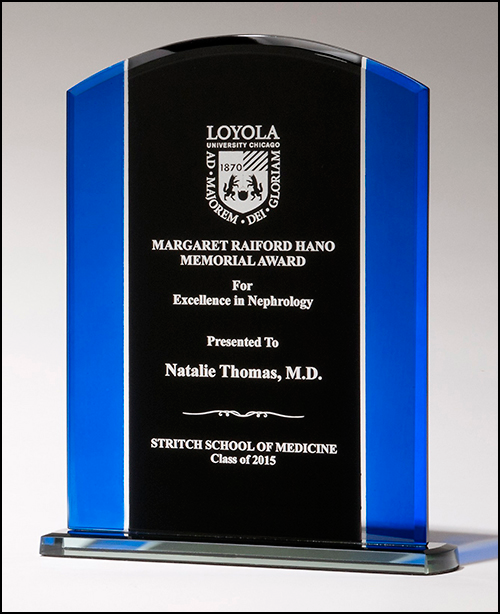 This award features 3/16" thick glass with black and blue silk screen. Please note that if a logo is uploaded which does not meet our engraving logo minimum requirements, an additional charge of $25 will be required to have the logo redrawn or edited to work. We will contact you before proceeding with the order if a logo edit/redraw is necessary. .cdr, .pdf, .ai, and .eps are the preferred vector formats. Bitmaps such as .jpg, .gif, or .png files need to be 300dpi or greater. Please note that even with a high resolution bitmap, engraved logo quality may be reduced when compared to a good vector logo.